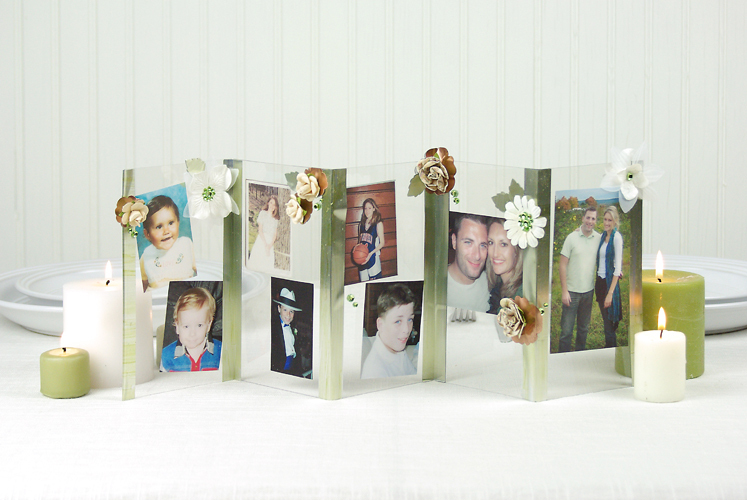 Project Description: Create a transparent centerpiece showcasing photos of the couple growing up that looks great from both sides of the table. Note: Because of the translucent nature of the Computer Grafix product, the photos can be seen from each side of the centerpiece. Avoid using any photos that contain text or lettering. Size digital or scanned photos to fit 7”x 4” panels and print onto Computer Grafix. Cut out individual photos and adhere to plastic panels, as desired. The centerpiece is comprised of five panels’ folded accordion style. Use green marker to color sheet of Silver Brush Funky Film. Swipe the marker back and forth over the film and don’t worry if some of the ink pools a bit before it dries – this just adds to the finished design. Cut ten 1” wide strips that are 7” long and reserve the rest to make leaves. Remove backing from one strip and adhere one half lengthwise to the left edge of the first panel. Fold the other half around the panel and adhere to the back. Run a bone folder over the foil to remove any air bubbles. Repeat this process to cover the right edge of the last panel. Adhere the middle sections together using film to cover front and back seams, as seen in photo. Leave 1/16” between each panel to help them fold. When all five panels are attached, fold accordion style. Die cut mirror image pairs of leaves from green tinted foil and adhere around flowers. Use rhinestones as flower centers and to embellish photos. (Wedding Centerpiece 5.jpg and Wedding Centerpiece 6.jpg) Adhere stemless flowers using liquid adhesive. Add flowers to both sides of centerpiece, as desired.